Stress levels return to normal, priorities come back into focus, food is more delicious, sleep is deeper, and life's most intense pleasures are magnified to unforgettable proportions. For some people just owning a yacht is enough. Others desire something more. If you are one of them rejoice - Brioni 44+ is created for you. The yacht is for those who have an exquisite taste and an eye for extraordinary craftsmanship. A yacht for the selected few that want to take their leisure time to a level they never knew existed. Everything is better on a yacht, and even better on a Brioni. Surrounded by the open sea, effortlessly slicing through the waves, you are truly the master of your fate and the captain of your soul, you are alive. Take your loved ones or your friends and navigate towards the sunset. The Brioni is so easy to handle you don't need any other crew than the people you cherish the most. Find a secluded bay where the stars shine brighter and your laughter echoes long into the night. Forget about the noise of civilization far away, unplug and stay a while. Brioni is built for that. Its huge water tank and solar power plant on the roof will make sure you won't miss anything for quite a few days. Go wherever your heart desires. Nothing in the Mediterranean is out of reach for you and your yacht. With a 350NM range you can adore the charms of Venice in the morning and reach the mighty walls of Dubrovnik without any stops. Slowly push Brioni's throttle and experience how effortlessly she gains speed and leaves lesser boats far behind. With a glance at the speedometer, you will see it finally peak at more than 42 knots per hour. That's the kind of speed that can cause goosebumps and makes your kids scream with joy. Another reason for excitement is Brioni's fuel consumption - even at top speed the yacht consumes less than 4 liters of fuel per NM! When there is no need for extra adrenaline, cruise comfortably at 36 knots per hour at 3250 rpm. We like to call this speed the "pleasure point" of the yacht. Why the pleasure point? Because Brioni's owners reported immense pleasure passing by the crowded gas stations and not having to spend their precious time in the murky waters and hot sun around them. As you will soon discover, this is only possible because of the vessel's advanced construction. It makes her much lighter than the average 44-footer. Tested and certified by Brodarski Institut Zagreb. Experiencing total freedom is possible only on a very safe and reliable yacht. Any kind of failure can put you in the marina for days and ruin your vacation. Rest assured, we have done all that is within our power to make the Brioni as dependable and safe as possible. You will have one of the best and most reliable engines around. The yacht is powered by two Volvo Penta IPS 600 motors. They were chosen after many tests and prove that Volvo is the true epitome of quality. 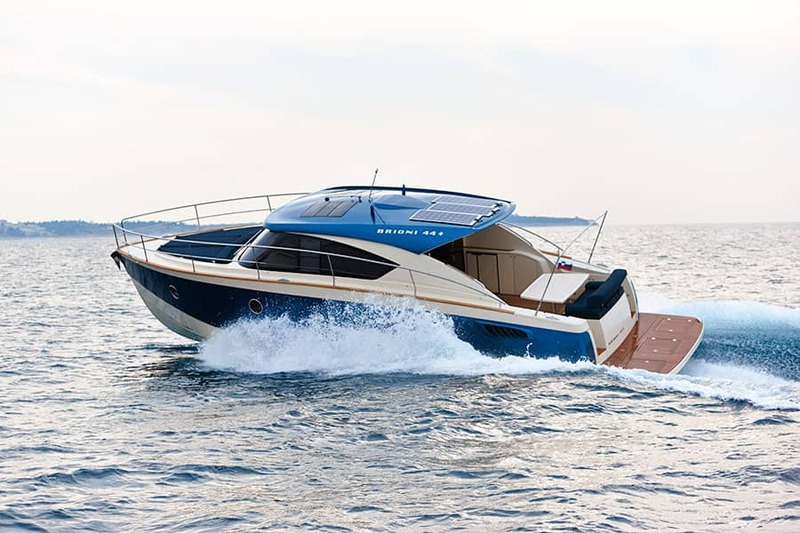 The 44+ is built to endure 1100 HP and 50 knots, but features "only" 870 HP and a speed of 42 knots. The safety gap ensures your safety even when the weather suddenly changes and the sea becomes extra rough. And Simply Enjoy the Ride! Being in control of a Brioni makes life seem simple and serene. There is no rush, only complete immersion in the nautical experience. 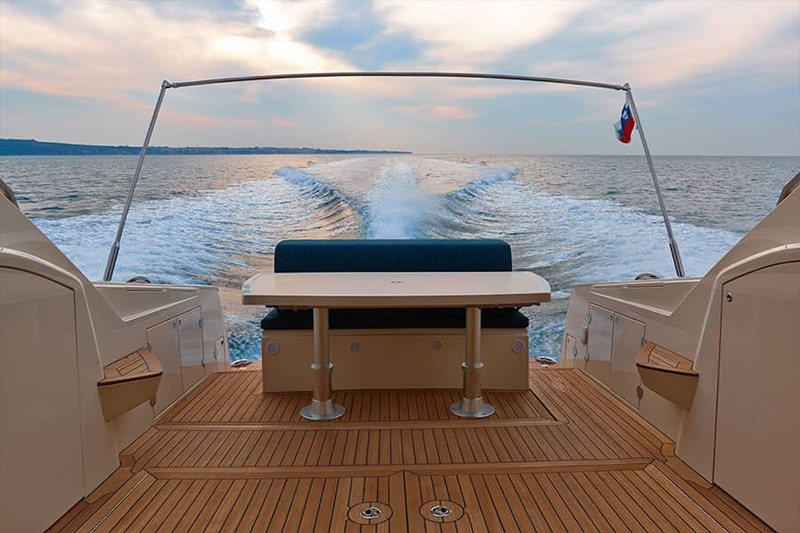 The 360° view at the helm, which is one of the yacht's most impressive features, evokes pleasant sensations. It's easy to see why - you get a feeling that the Mediterranean is right under your feet. As a captain you can relax in one of two comfortable chairs, take a look at the modern navigational instruments and easily steer your Brioni towards adventure - either with the ship's wheel or the joystick. Do you prefer old-school methods? If so rest assured. There's a special space provided for good old paper charts. A captain's hat can also be arranged. Heat from even the hottest of days won't get to you at the helm. 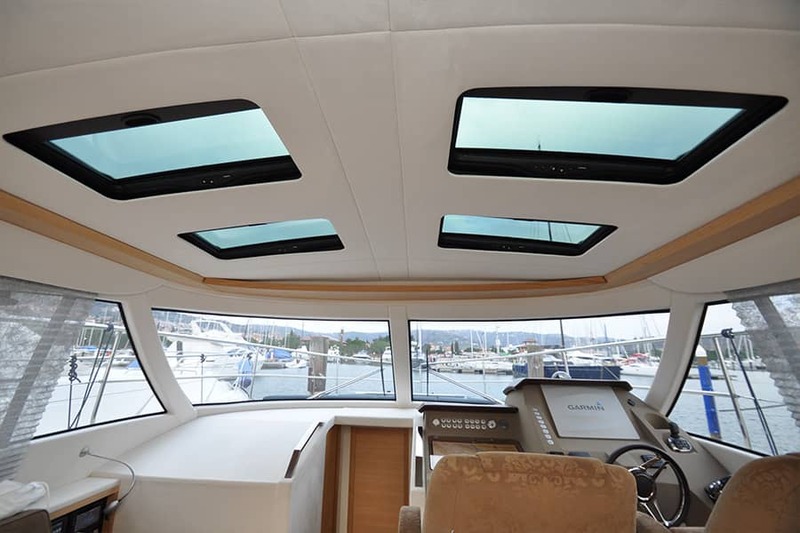 Simply open an electric moon-roof along with adjustable side windows, let the salty sea air flow through and cool you down. There is nothing like the warmth of sun on your face, with a yacht like Brioni under you, open sea ahead and a drink in your hand, you have everything you need for a perfect getaway. 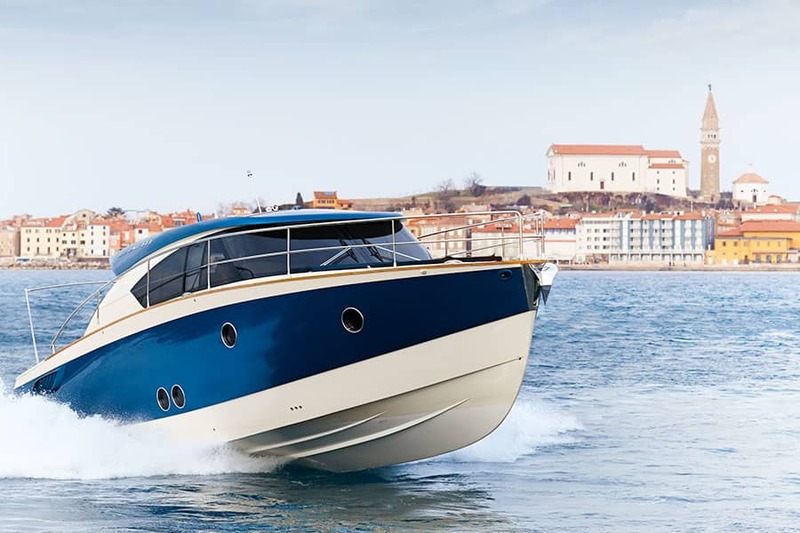 Steering the Brioni feels much more like controlling a water dancer than driving a yacht. Perfect balance and incredible lightness merge into harmonic movements and responsiveness that makers of other 44 footers can only dream off. It�s said it only takes 10.000 hours of practice to truly master anything. We spend 12.000 hours on each and every yacht. 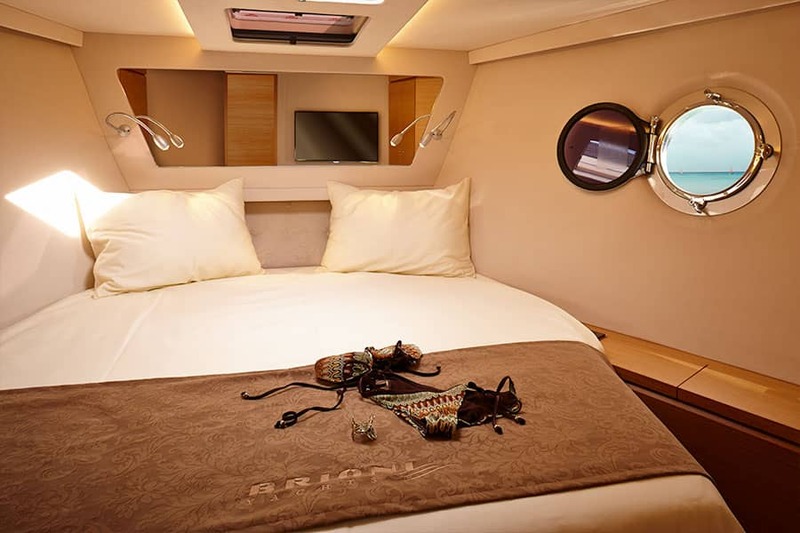 Otherwise we wouldn�t dare to claim that we can satisfy your every yachting desire. Brioni�s design is unique in its own way. The longer hull gives her elegant lines that attract the eye and tease the mind. It�s a yacht onlookers won�t easily forget. The unique curves offer more than aesthetics � they also give you more space and stability. Everything other than the hull can be tailored to your wishes. Perhaps you�d like a cockpit adapted to host unforgettable intimate cocktail parties, a personally preferred sound system to play jazz tunes to you a fool moon. Perhaps you simply want enough space to create memories with your kids? Tell us what you love and we will make sure your Brioni has it. We don�t follow the needs of mass market; we follow the needs of individual clients like you. If you want a unique yacht design which you can proudly captain reflecting your personality and success you will have a hard time finding a better fit. 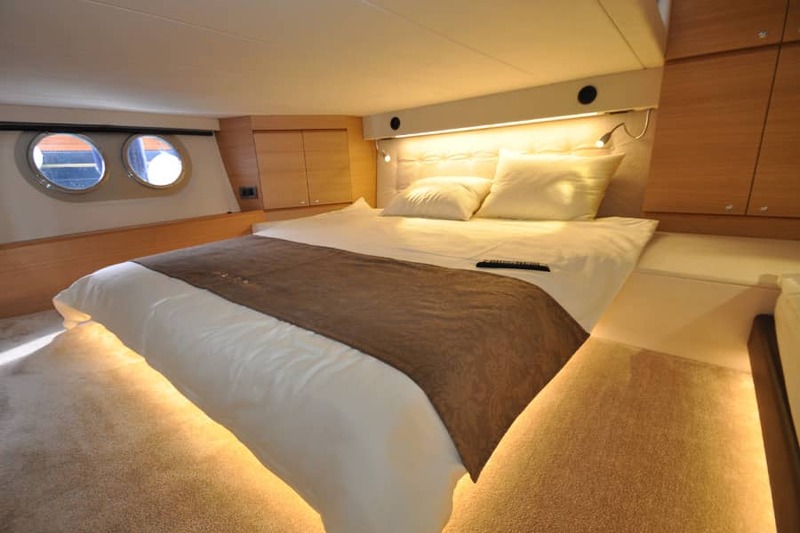 Our yachts are built using modern techniques such as vacuum infusion and infusion of polyurethane foam. 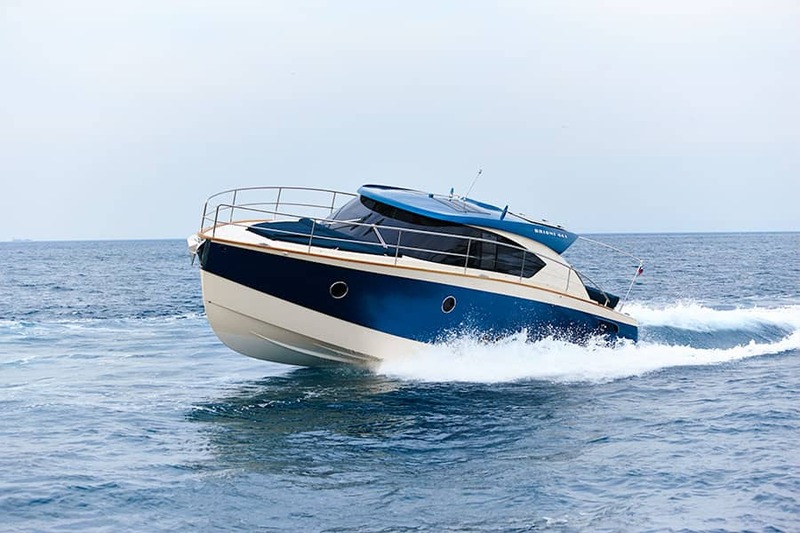 Using those two methods results in an incredibly homogenous and safe yacht, as they bind the whole structure together as securely as possible. They also make the yacht much lighter, while ensuring buoyancy and floating characteristics in the top of their class. 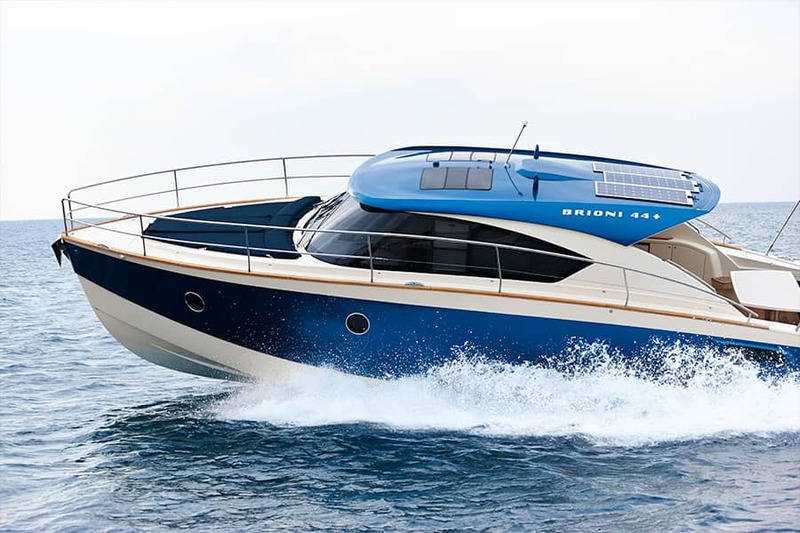 An averagely equipped Brioni 44+ weighs only around 10 tons, which is 3 to 5 tons lighter than most of the vessels in its class. Simply put, these methods enable you to travel faster, further and safer, while reducing engine noise. Steering a Brioni is a thing of beauty. Each move is smooth and precise and not a drop of energy goes to waste. You feel the immense power below you and have perfect control over it. That is because in the 12.000 hours it takes to build her, we carefully position each and every component of the yacht. Even water and fuel tanks are built into the hull in a way that achieves perfect balance and a center of gravity only 11 centimeters above water. That way the yacht is extremely stable even without stabilizers and very light at the same time. It also diminishes the chances of sea sickness ruining your vacation days. Your relaxation is our priority and we strive to eliminate all unnecessary rocking of the boat. The moment you set your eyes on your Brioni 44+ one thing becomes clear, she is timeless. She has a style and class that will never get old. And once you enter Brioni, prepare to be seduced by luxury joined with charming warmth. The yacht will make you feel welcome from the very first moment on. Brioni 44+ is a sight to behold. , evoke a feeling of immense pride when looked upon. You will desire to show your Brioni to the world, and the world will love it. 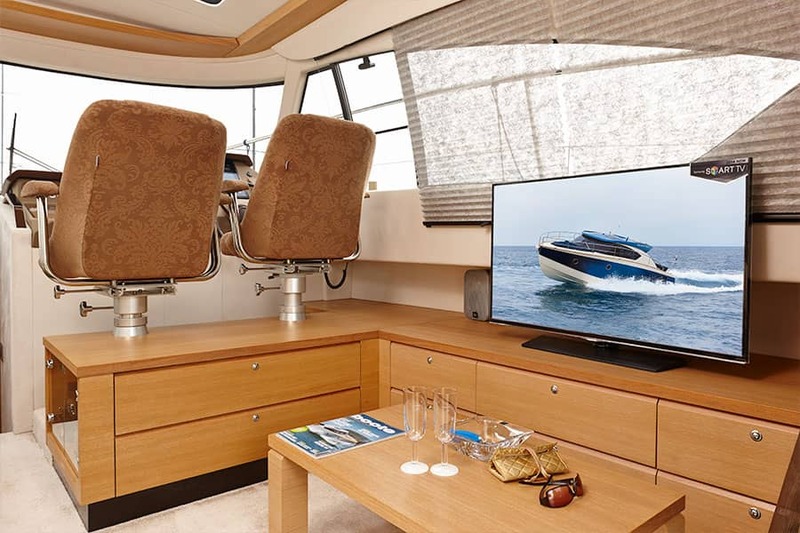 The Cockpit is the heart of any yacht. It�s a place where you unwind, a place where you enjoy good company, where your share laughs and make new memories. It�s a place where it�s easiest to forget ones worries. That is why yachters seek spacious and smartly designed cockpits where they love spending their time - and Brioni certainly provides one. Its crown jewel is a big table that you can transform into a sunbed in a matter of seconds. It uses modular cushions for which no extra space is needed. There is nothing that feels better after a delicious lunch than a nice rest in the sun with a gentle sea breeze. Cleverly placed compartments make it easy to keep the space neat and tidy, while making sure anything you might need is within reach at any given moment. There is enough of them to store away anything. Even your troubles. It happens all too often that you feel a bit claustrophobic on a yacht. It might be the low ceiling, dark shade of wood or clumsy elements. You will feel no such thing on a Brioni. 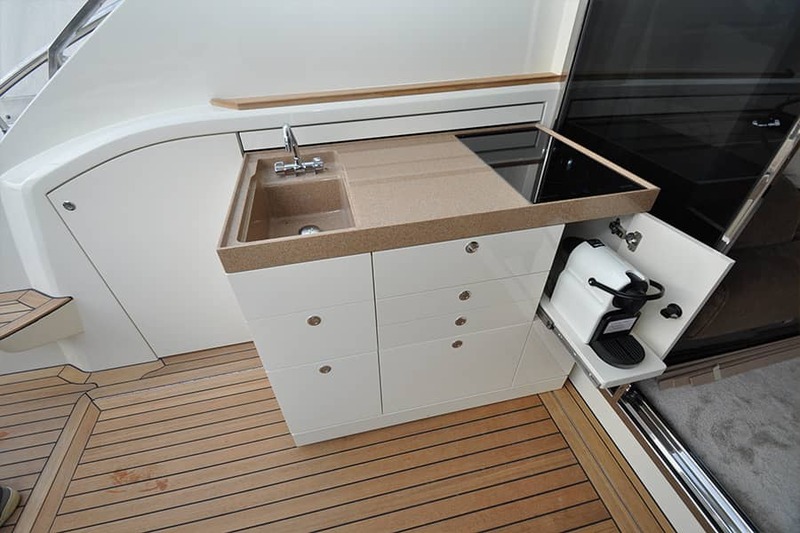 It�s hull design makes the yacht interior bigger, providing a generous amount of room to move around. There is a pleasant saloon for those rainy days and colder evenings. 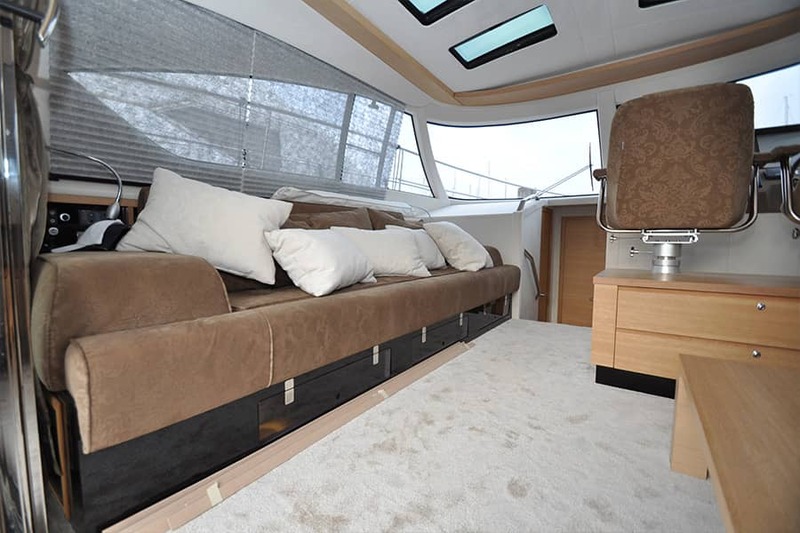 Instead of succumbing to the bad weather, spend a nice lazy day inside and enjoy the soft coziness your yacht provides. 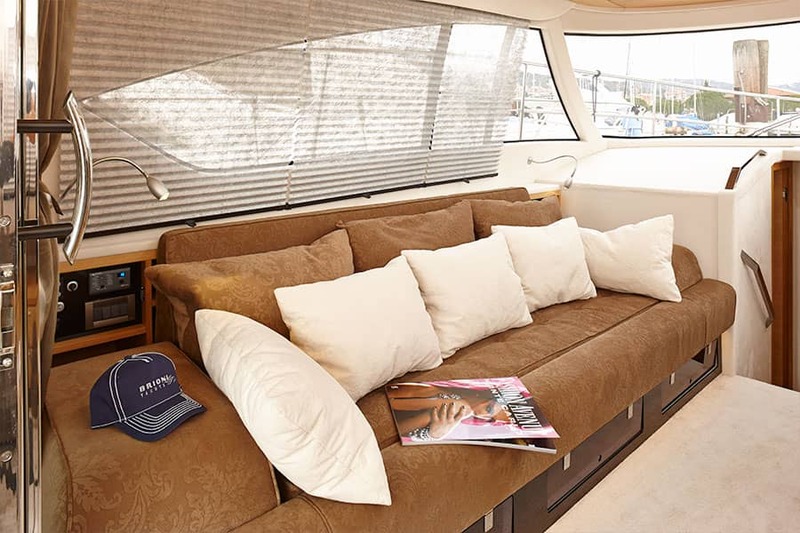 The saloon can be customized and furnished according to your wishes, and it can also sleep up to two unexpected guests on its large comfortable sofa. Under the deck, two bright cabins await you when the day is over. Superb queen size beds with custom tailored linen will make even the lightest of sleep�s sound. The Hidden lights around the bedroom are the perfect finishing touch to the Brioni�s interior design. With their pleasant glow you can create an intimate atmosphere or bright reading space. Within you will find that there is plenty of wardrobe space and elegant drawers for everything you brought with you. When it comes to space � there is also plenty of it in the bathroom. Instead of fitting two small bathrooms in each Brioni, we decided on one spacious one. 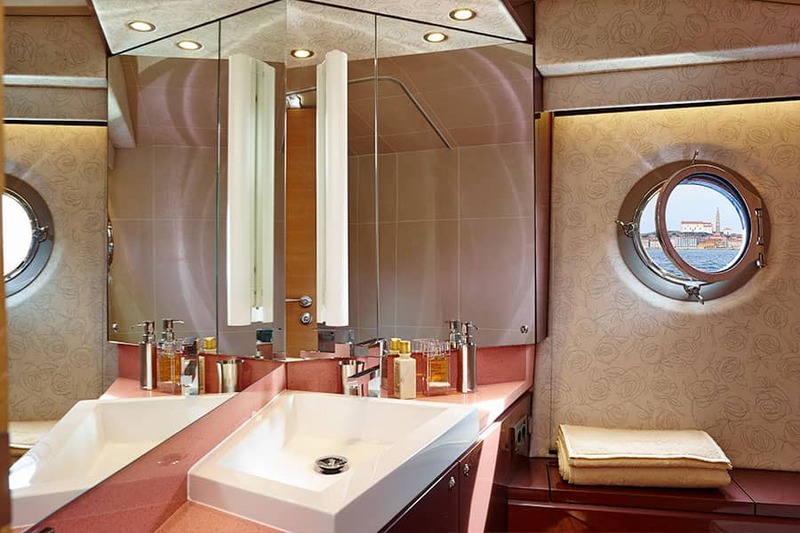 It proves that taking a shower on a yacht can be just as relaxing as at home. Every detail on the yacht is designed with one final goal in mind � that you will never feel uncomfortable during your stay. Expect only top quality materials on your Brioni. By all means - inspect them with all your senses. Look at, run your fingers over, use them and know that no expense has been spared. These materials make the Brioni beautiful but also durable and practical. She�s the perfect vessel for your leisure time for years to come. Every yacht leaves something to be desired. Every boat owner thinks some small detail could be a little bit better. We searched for these desires and transformed them into our inspiration. Our innovations make these small sometimes unnoticeable problems disappear. These features will leave you wondering how you ever survived without. �Where is the kitchen?� is a question that gets asked a lot on a Brioni. After a smile and a gentle tug a whole kitchen smoothly slides out from the side of the cockpit. If you have any kids on board, they will think it�s magic. Brioni�s kitchen design follows our �out of sight, out of mind� philosophy. When you don�t need it, you simply push it back into the side wall. 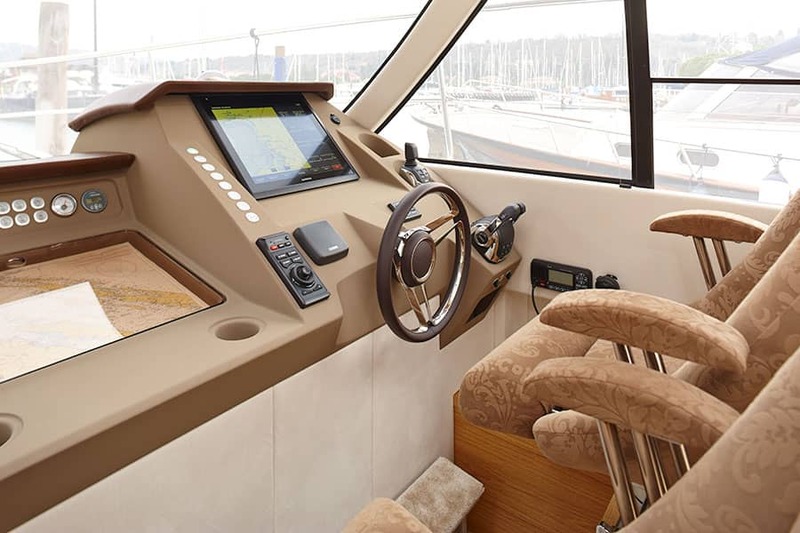 This novelty provides even more cockpit space, and it works so well they called it �a work of minor genius� in the UK boats review. The Kitchen is located outside the saloon. 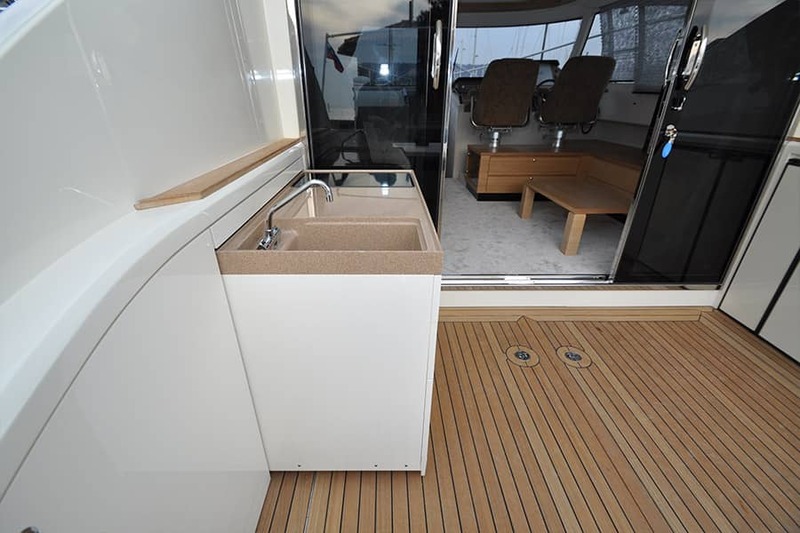 After using it, the air in the yacht will still be fresh and nothing will smell like sea food. Whoever cooks does not have to sweat inside the yacht, but can enjoy a light breeze & the company of other people in the cockpit. What more could a chef ask for? On Brioni, you will enjoy a lot of smartly placed compartment and drawers. 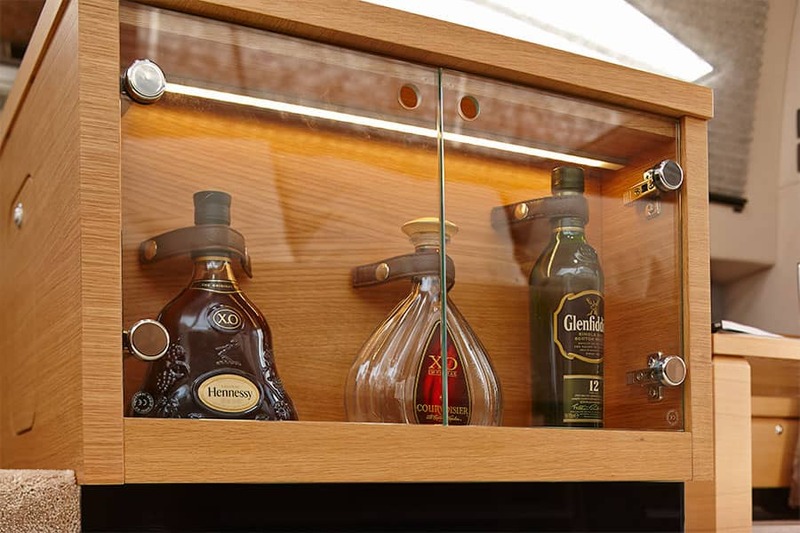 They are placed all along the yacht and there is enough storage space to store away anything you want. 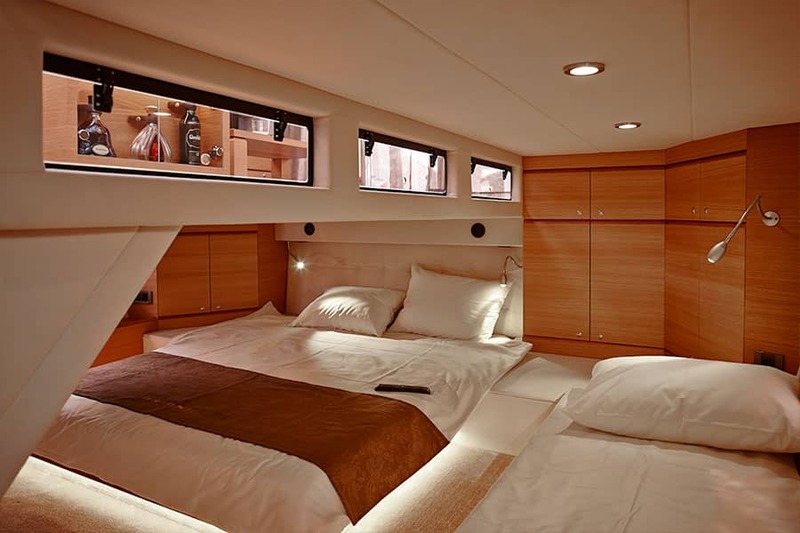 The storage space volume can be compared to a 50-foot yacht. 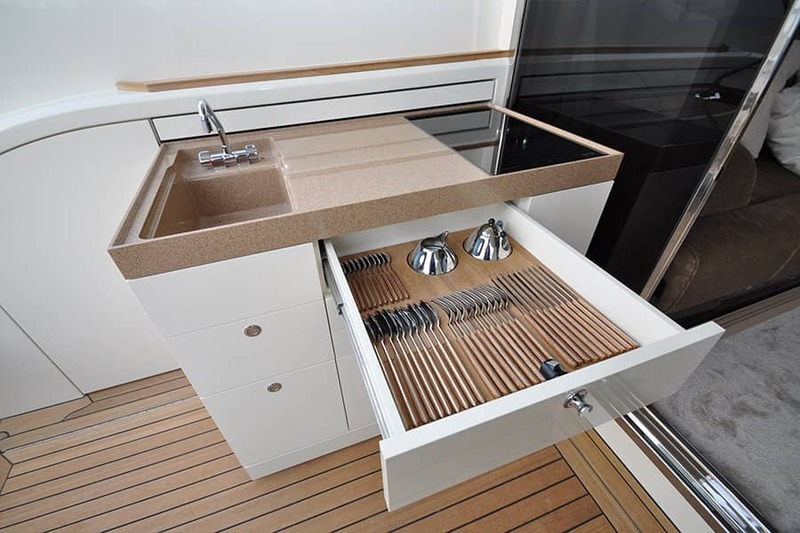 It might not seem like it at the first glance, as all the compartments and drawers blend into the yacht�s design. Once closed they become almost invisible and Brioni keeps its classy look. Moving a jet-ski or by boat around can be tough. Getting in and out of water can also be bothersome - especially for elderly people and young kids. Except if your yacht is equipped with a large hydraulic swimming platform. It makes everything much easier. You can lower the platform into the water to load a jet ski or safely teach your kids how to swim. Grill on it with an inch of water protecting your yachts exterior from oil and other dirt. Featuring a stand-up shower, for a hands free experience it�s full of those small innovations that make your voyage better. The needs of a yacht owner can quickly change, therefore it must be important that the interior can be adapted without any inconvenience. All of the furniture on your Brioni is put into its place after the top of the boat is sealed. This means that in 5 years, if you decide to replace the interior, you can easily do so. We know people can change their minds so we make sure that there are no bad experiences on or off your Brioni. We are available to talk by telephone, email or in person if you prefer. I agree to let my data be stored for contact purposes. Surrounded by the open sea, effortlessly slicing through the waves, you are truly the master of your fate and captain of your soul. That it means to be alive. Take your loved ones or your friends and navigate towards the sunset. Brioni is so easy to handle you don't need any other crew than the people you cherish the most. Find a secluded bay where the stars shine brighter and your laughter echoes long into the night. Forget about the civilization far away, unplug and stay a while. Brioni is built for that. Its 800 liter water tank and solar power plant on the roof will make sure you won't miss anything for quite a few days.